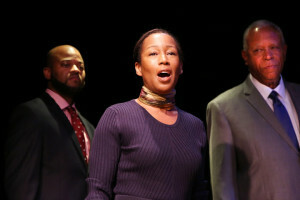 L-R: Shane Taylor, JoAnna Rhinehart, Art McFarland. Photo by Gerry Goodstein. Producer Woodie King has brought the production “In White America,” to the Castillo Theater stage wherein six performers, 3 Black, 3 White, 2 females and 4 males, recount the history and African American experience under the rigors of White rule in America. This docudrama regales 2 centuries from 1788 to 1957 and ends in present day. These events are told via speeches and historical accounts. An historian, Martin Duberman, the playwright, catalogs a history written in pain. It is an ancient tale told many times but nevertheless remains a never ending story in search of resolve. While I viewed the play directed by Charles Maryan, I could not help but think, a new slant on the play would have been to start the play with its ending and then reflect back on the history. Why? Because the end offers hope. It’s a challenge. And perhaps even a pledge that things cannot remain as they are and will not be allowed to remain as they are. The throwing down of a gauntlet that speaks of an ending to manifest new beginnings. The story of White America and the people’s of color is an ugly one. It is also a story of triumph and endurance in the face of struggle and adversity. The play “In White America” defines America via its deeds and via the courage of both black and white Americans who sought and still seek to heal the wounds of hatred, adversity and national disgrace. We relive our ancestors experiences via this play through the words, letters, diaries, and documents of those embattled souls who experienced the events of Middle passage, slavery, Civil War, the abolitionist movement, Jim Crow, segregation, and WW1 and 2. It is a history lesson laid plain to remind the audience of the African American struggle in White America for equal rights, educational equality, and the right to vote. We hear the voices of the educated and uneducated alike; the young and old in script and in song retelling the Black American story. During the show, we hear the views of those like Frederick Douglas, Thomas Jefferson, Sojourner Truth and Woodrow Wilson. We hear the slave voice and the freedman’s voice through the actors Nalina Mann, Art McFarland, JoAnna Rhinehard, Bill Tatum, Shane Taylor, and the rhythm of our joys and sorrows through the strumming of guitarist Bill Toles. We enter the mind of both white and black, both oppressor and oppressed. The stage set is simple and somewhat stark, perhaps as a reminder of the stark lives many Americans lead. The history of Black folks in America has been a long and arduous journey and still we struggle as the jail cells fill with male and female African Americans, while unarmed men and women are killed by an over zealous police force. We are given to exam that in a country that calls itself great, poverty bears the face of color. While privilege is often extended to a race of people who ofttimes deny any culpability. Who say “…it wasn’t us, we didn’t do it. It was our ancestors,” while at the same time enjoying and benefiting from the very privileges their ancestors put in place and even institutionalized. Despite their advantage those privileged complain about Affirmative Action being unfair. Complain their jobs are being taken by African Americans whom they claim are the new privileged, yet in most office settings black folks are relegated to the mail room and support positions. They claim that African Americans are unduly taking advantage of the welfare system when in fact the greatest number of welfare recipients are white people. It appears that in White America what is peddled as truth is defined by those holding the reign of power. Now, they say “Don’t All Lives Matter?” Therefore, they espouse the Black Lives Matter Movement should be dismantled enforcing this sentiment through the power structure of their media. Even pandering to racists through political presidential campaigning that proudly sponsors an agenda of bigotry and xenophobia. Yet they claim they elected a Black president thereby as some among them see it, all racial issues have been resolved. This,while demonstrating unprecedented disrespect and hatred toward the reigning president. All lives do matter within an equal system of justice and equality. Within a system wherein no one is judged for their race, color and/or creed. The values America claims to embrace…are not. Therefore, as long as hypocrisy exists, some are going to have to be reminded that those who continue to be disfranchised have a duty to make certain their lives matter. Given the tragic history of America, yes the peoples of color are taking the position their lives matter. Black people in particular are taking this stance and are loudly declaring “Black Lives Matter,” because they do. The production “In White America,” runs until Sunday, November 15th at the Castillo Theater located at 543 West 42nd Street in Manhattan. Go see it!